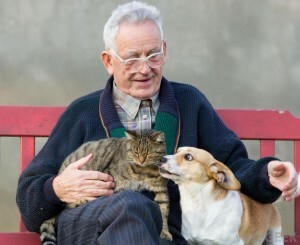 Do people with pets live longer? “An estimated 60 percent of American households have at least one pet, with dogs and cats (165 million, combined) numbering more than half the human population.” Some people choose to buy a dog or a cat because they want companionship. Pets can not only improve the quality of their owners’ lives, but new findings show that they may also help them live longer. The American Heart Association published research in the journal Circulation that analyzed whether or not people with pets live longer. The study found associations between pet ownership and low blood pressure, heart rate, and cholesterol levels. Another study used participants who had high blood pressure and high stress jobs in which half of the participants agreed to adopt a dog or a cat. Six months later, the participants who got a dog or a cat had significantly lower blood pressure. Both of these studies found that within the group of people who do have heart disease, the people who own a pet have lower death rates than those people who do not own a pet and are more likely to survive a heart attack. In a study by the Minnesota Stroke Institute, which followed 4000 cat owners over a period of 10 years, it was found that being a feline owner can decrease the chance of dying from heart disease and could cut your heart attack risk by nearly one-third. A Wilkes University study found that stroking a dog for 18 minutes caused a significant increase in secretory immunoglobulin A (IgA), your body’s natural antibody against invading germs. Another study found that people with pets make fewer doctor visits, especially for non-serious medical conditions. Research in the question on whether or not people with pets live longer is difficult because of the participants and other variables such as: Dog owners may live longer because they are more likely to exercise since they have to walk the dog. Sick people may tend to not get pets. Healthier people may want to get a pet. New research by the University of Sydney is trying to limit the variables and test the exercise, psychological, and social benefits of owning a dog to see if dog owners live longer, are less likely to develop heart disease, and more able to beat depression. The research from this large longitudinal study may change the theories. However, according to the current data, it is advisable to get a pet because people with pets have a higher chance of living longer. This entry was posted in Uncategorized on November 28, 2015 by Sarah Rose Peterson. As a pet owner and a massive dog lover this blog is great to hear. I do agree that although the research seems to link a longer life with pet owners, the statistics have many limits, with even chance being a possibility. Pets definitely improve an owner’s mood and have the possibility of improving the owner’s overall quality of life. Whether or not owning a pet improves life is definitely questionable. One interesting thought is that owning a pet improves an owner’s overall confidence and mood http://www.helpguide.org/articles/emotional-health/the-health-benefits-of-pets.htm . If this is the case, maybe the correlation isn’t owning a pet that leads to a longer life but being happy and optimistic that prevents sickness.